We recently had the privilege of inviting Leon of Animo et Fide Ltd to conduct a series of training seminars covering leadership, management development, and welfare and stress management. The sessions covering stress management and welfare were of particular benefit to our business given historical losses in productivity due to stress and mental health deficiencies. Our emphasis on promoting work-life balance and positive mental health was facilitated by Leon’s workshop for which my colleagues and I are incredibly grateful. One veteran employee said with praise “the training was the best, and most engrossing I’d received in over 37 years with Swan”, whilst a younger colleague expressed with appreciation “the course engaged me and was more relevant than anything I’d received at school”. We believe the reason for Leon’s success is his ability to draw on his military and personal experiences articulating them in a way that is applicable to civilian life and subsequently in business. 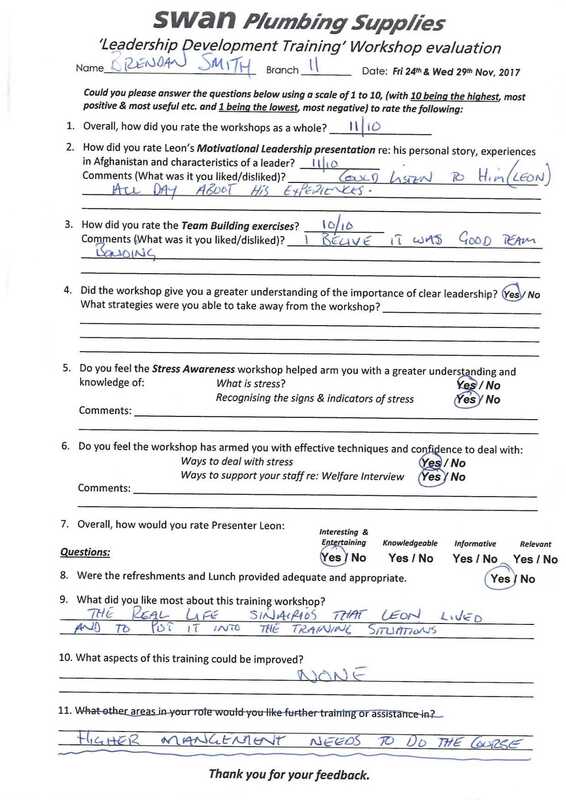 We strongly recommended Animo et Fide’s training and development courses. Thank you so very much Leon for the outstanding “Leadership Development and Welfare Awareness” workshops you delivered to our Managers and Junior Managers recently. 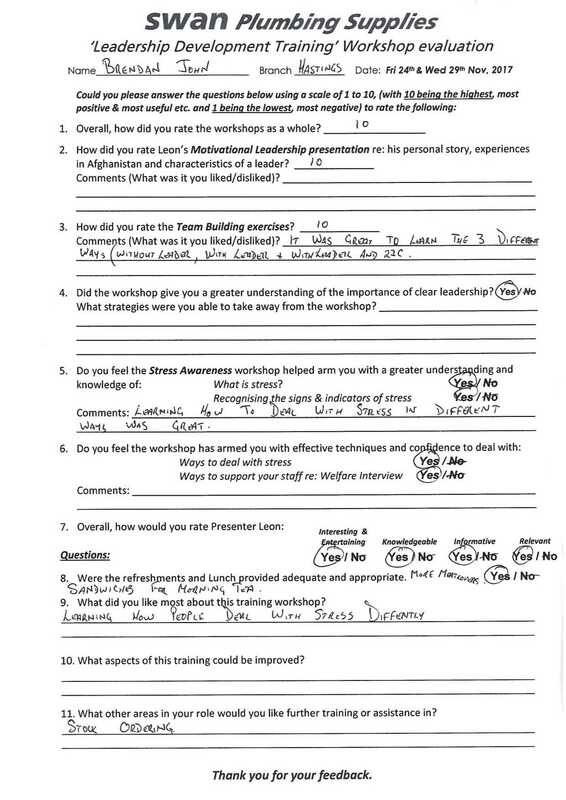 Having sat with our staff in these workshops and gauging from their feedback, every single one of our participants not only enjoyed the workshops, but also commented on how much they took away from them. Leon your engaging manner as you shared your personal experiences captivated participants and the activities put into perspective the importance of leadership styles and the characteristics required of a leader. Your empathic nature and approach in helping our staff to recognising stress and arming them with the appropriate tools and techniques to help alleviate stress related problems was invaluable. 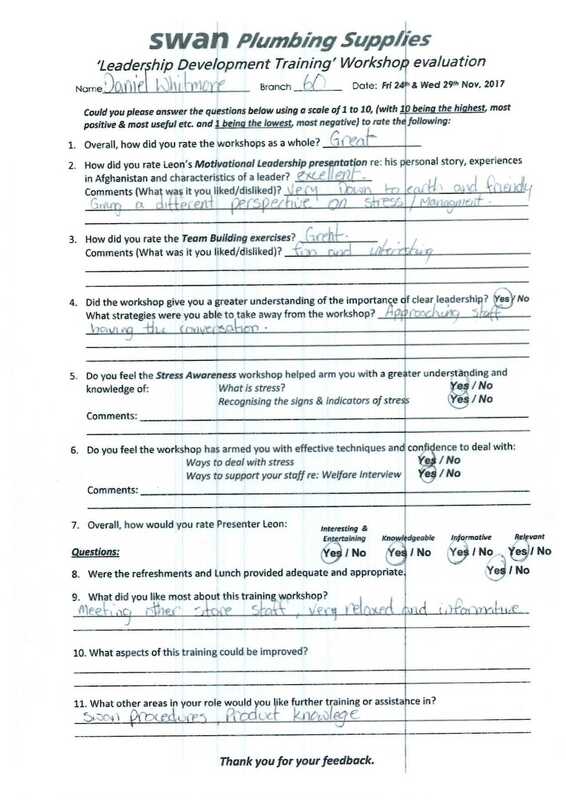 We look forward to working with you again Leon and would highly recommend your workshops to any organisation who value their staff as their most important asset. 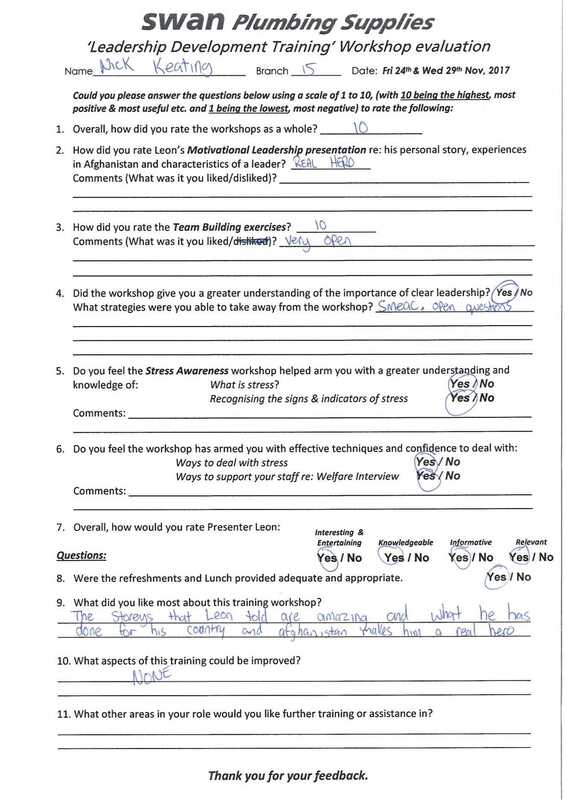 Please see below all the internal company feedback from the 12 participants of my 2 Day Junior Management Package. I travelled to Victoria, Australia to deliver this course to a group of Junior Managers and it was an absolute pleasure working with such a keen and motivated group. I look forward to delivering again next year having been invited back. I was extremely fortunate to have Leon working with us during the final months of his RAF career. It was clear from the outset that he was a natural leader, astute manager and possessed an enviable ability to communicate effectively with personnel across all levels. 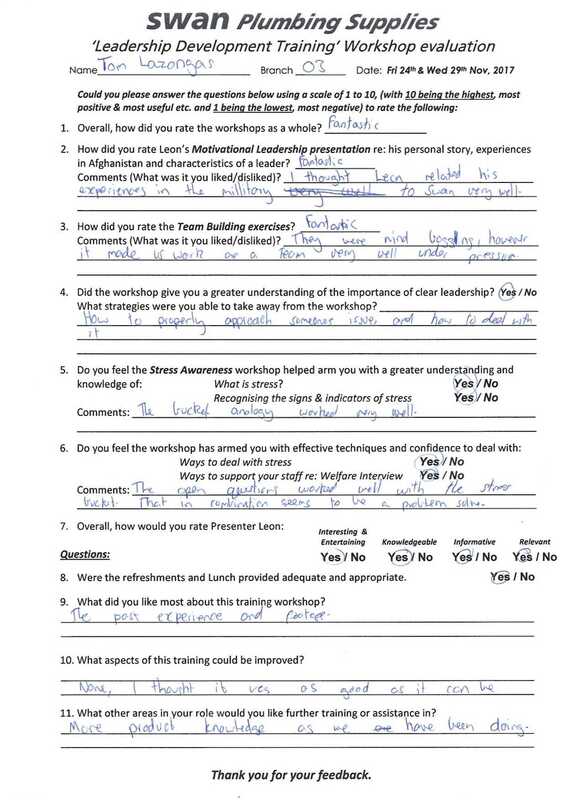 Typically proactive, he designed a Leadership and Personal Development Training Programme at the earliest opportunity. It rapidly became apparent to both his fellow military and civilian staff, together with our 90 hand-picked Junior Officer candidates, that his methods and training techniques vastly improved the performance of every squadron member and the organisation as a whole. 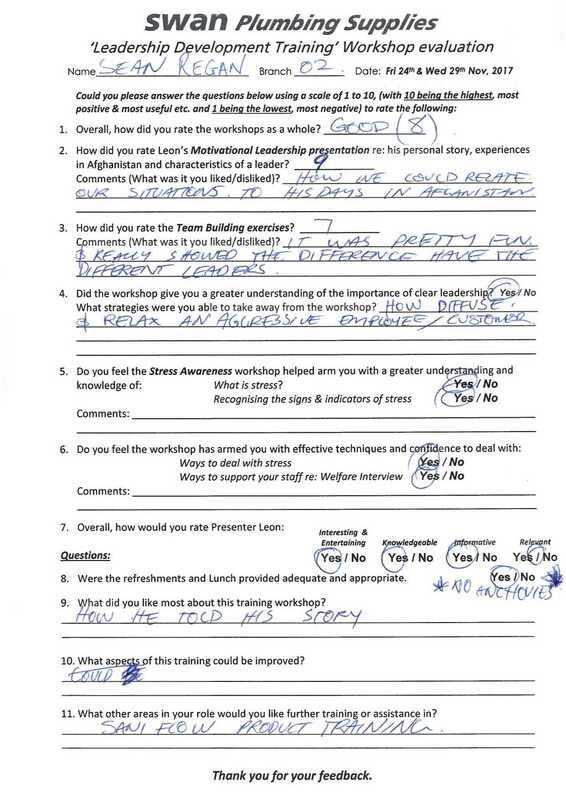 With regards to ensuring the organisation worked together, Leon achieved this by organising a Team Building weekend for the new 20 employees, and through not focusing solely upon individual development, but through a comprehensive package of practical leadership exercises, enabling the group to meet the training objectives as a cohesive team, this proved extremely effective and long lasting. As a previous Fighter Pilot I have had the privilege to work with several outstanding individuals throughout my career and it is evident that Leon is right up there too. 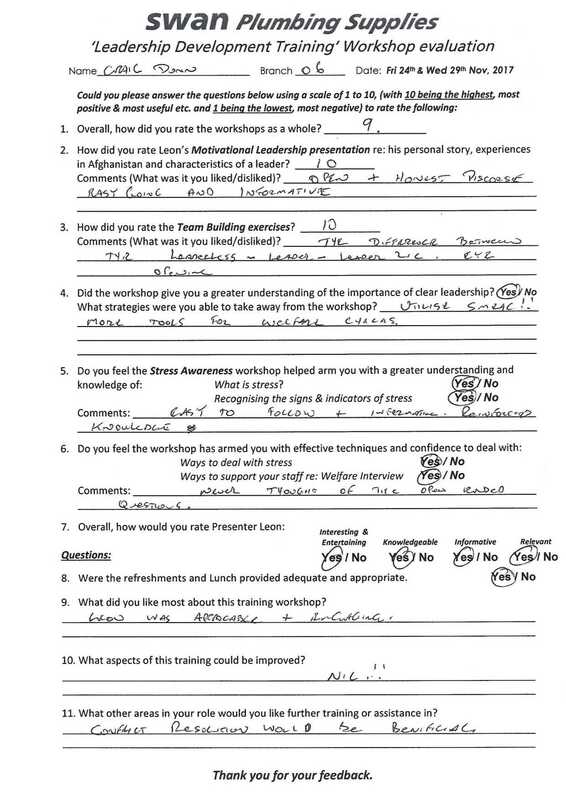 Having witnessed at length Leon's exceptional performances as an impressive and highly effective leader, communicator and instructor, qualities that have been honed over 15 years of operational military flying that thankfully few have had to experience, I have no hesitation in comprehensively recommending Animo et Fide's Leadership, Management and Stress Awareness Training programmes.